#this mounts the ubuntu image into the directory "ubuntu"
where 192.168.1.100 is the IP address of your android device. Why have I used “socat” instead of “netcat”? Well, netcat is a line-based tool. Since we are sending binary data it usually takes some data until something similar to a newline is found (netcat triggers the packet transmission on this condition). Most often this will be more data than the maximum packet size. Therefore, netcat packets are usually fragmented IP packets (something you should avoid). Socat just sends unfragmented packets when the threshold (in this case 1024bytes) is reached. All this does is to forward the packets from “rx” to the UDP port 5000 of your device. And voilà, you should see your camera’s image. The latency is ok and should be usable. My PC is still a little bit faster but that is not too surprising. I have some ideas on how to optimize everything and keep you posted. Concerning battery life I was quite surprised. The app and wifi dongle drained the battery 14% after one hour of runtime. So I’m quite confident that this would allow me to at least stream for 5 hours with a full battery. How much lower was the latency using the PI for decoding? I can currently get an average of 140ms decoding on my laptop using gstreamer/UDP but would love to be able to get less if possible. Comparing the transport over wifibroadcast with plain UDP should not change much latencywise. And PC vs PI is currently unknown. I haven’t measured it. They are pretty close together with maybe a tiny advantage on the PI. By adapting the h264 parameters you could gain some ms. https://sparkyflight.wordpress.com/ has tested a lot of variations. In the rx part i would like to use the stream in oF (c++ framework), i tried direct stdin method and a gstreamer pipeline to read the video. This works but i get 1frame per minute or less,i think that stdin its not threaded so its locking the app. Its possible in the RX part to create a stream in local and capture the stream in the same computer with another app, i need to be able to apply some shaders to the stream in order to get barrel and chromatic distorsion correction in oculus rift. Have you tried something similar in the android port? Does it increase the latency? are you planning on further development on android as an rx-device for wifibroadcast? but using it is quite uncomfortable cause of the chroot to ubuntu. having your rx-programm compiled for native android would be great together with gstreamer for android. for example a lg g3 would be a nice device with high resolution for using it inside goggles. wow, as far as I know you are the only other person that also went down that painful road 😉 did you use my app for displaying the video? because android is such a pain to develop on i stopped completely working on it. although i totally agree that an android device would be a perfect receiving device. 2) Having the driver ready, the port of wifibroadcast to java or NDK should be easy to do (compared to the driver). 3) The problem of decoding and displaying the video is very simple and already solved in my app. concerning latency, i think this would not change much. most part of the latency comes from the h264 decoder and this cannot be tweaked much. unfortunately. well, you showed the way, so it wasn’t too painful 😉 just a lot of reading about android kernel compilation, but there is plenty of information on that. especially for nexus devices, it’s not that hard, toolchains and kernelsources, everything is available. the harder part for me was a working chroot, i tried too many different ways and messed up my tablet with different busybox installs. i discovered sshdroid too late, till then i used adb shell over usb and that was really painful. rooting a device and changing the kernel is doable, so the driver part should be ok.
still, you would have to compile a kernel for every different device, but i’m sure people would agree on not too many different devices which are suitable. so for me, an android phone is still the perfect device for receiving. costs for a raspi + high resolution (touch) display + power supply isn’t much lower than a last years phone. so the missing link for me is the android software part. During our discussion an idea for a shortcut to a “play store ready” app popped out in my mind. Instead of reimplementing the wifi driver for android maybe it would be possible to use the card without exactly knowing what we are doing? and i’m using 2,3 ghz and not all people want to use the same channel, and if i understood your described way, than we still would need different dumps for different channels etc. speaking of android kernels again: i already testet, if i could compile a kernel for a newer device. as already mentioned the lg g3 looks interesting to me. this time i used sources from xda-developer and a sabermod toolchain. the hardest thing was finding a working toolchain: newest is not always best. 😉 reconfigure kernel, apply 2,3 ghz patches and compiling was straíght forward. just could not try it out, i do not own a lg g3. buying one makes only sense to me, if someone or several people a willing to jump on that train. i don’t have the skills for porting your rx to android nor programming a touch enabled gui for channel-switching, gst-pipeline configuration etc. so i still hope …. Wouldn’t it be a possibility to Receive the Data with the Raspberry Pi and then transmit them over USB to the Android Smartphone? So it’s no driver needed and a “simple” app would do the Job. Maybe it’s even possible to still use the Raspberry to decode and send the decoded Data to the USB Port. Mh, I never followed that thought because I was always looking for a software-only solution. But the more I think about your idea, the more I like it. Sending the video data uncompressed seems unfeasible. The data rate explodes right after the decompression. But forwarding the compressed data should be no big deal. And there it might even be possible to use normal wifi. This would give you a true wireless experience like the fatsharks. Leave all the heavy raspi, battery and n-times diversity antenna setup on the ground and connect your phone to the receiver via wifi. This should not be an issue since at that short distance it is almost for sure to have a good connection. And just a simple transmission of the data shouldn’t add more that 10ms latency… mh, this sounds really good. And it would even be possible to connect more than one device at the same time. They just need your app and can watch my flight. Unfortunately my coding skills are far away from realizing it..
hi befi, don’t you think, we will run into problems with the 2.4 ghz transmitter nearby? or do you think, it doesn’t matter, cause of the short distance? my wlan at home drops performance, as soon as i switch on my 9x. or are you talking about 5ghz wlan for the local connection. Isn’t the TX code all we are looking for? The only difference is, that the stream don’t come from the cam but from the RX program. 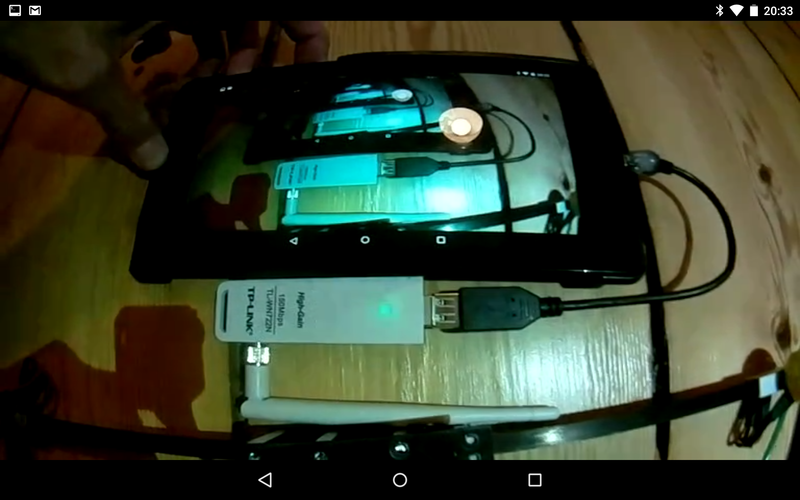 The Raspberry starts an AP with a CSL300 Wifi Stick and streams the video with socat to my Android device (LG g3). But unfortunately it seems, that its too much traffic for the usb controller. I receive only a lot of pixels, no real picture, and also the packet loss raises extremely as soon as there is any traffic on the AP (even when I’m logging in and receiving the IP-Address, you can see a lot of packet losses). I’m using 2 WN722N for receiving the stream and 1 CSL 300 for the AP right now. The AP is working at 5Ghz. What type of computer are you using? Raspberry 1 or 2? I had to change the receiving wn722n to mcs1, otherwise it wasn’t usable. I testet it with only 2 wn722n, the goal is 4. Have to see, what the usb traffic says..
Next step is to view it side by side.. But I’ve never programmed anything for android..
Have to correct me, the problem was the socat pipe I used. Unfortunately, this doesn’t seem to work properly. So it doesn’t seem to have problems with the traffic on the usb bus. I am always loocking for ways to reduce the latency of h.264 streaming. Lately, I stumbled over this site http://moonlight-stream.com . They do basically the same like we do for fpv, streaming h.264 video to your android device, but in purpose of game Streaming. As they claim to get latency well below 100ms on Android nVidia Shield f.e, i got motivated and decided to take a look at mediaCodec usw. So I felt free to develope your app further, modified it a bit to reduce latency, and added a side by side mode using openGL. At the time i’m getting 170ms end to end at 720p 30fps on my Huawei Ascend p7, which is pretty good for the slow mali450mp gpu,and i hope to be able to reduce it using the “moonlight hacks” (they seem to manipulate the h.264 data hardware-decoder dependent). I will shortly try your app. Concerning latency: Did you compare your app with the original app? I never measured it’s latency but always felt it was quite a bit slower than RPI or my laptop. That is also the main reason why the development has stalled. If you could measure the latency of my App with the same method it would be a great way to quantify your improvements. If you could bring the latency down to a laptop-comparable figure, then that would be really great news. I absolutely share your enthusiasm of using a smartphone as display device. However, there were always the two “issues” in the way of transforming a smartphone into a killer FPV device: Latency and missing wifibroadcast on Android. You seem to be on the good way with point 1) but how to you take care of point 2)? Using a rooted device with custom kernel as I did or do you forward the video data from a raspberry pi over normal wifi to the phone? Another thing I’ve found lately is that there is a userspace pcap App for Android: https://www.kismetwireless.net/android-pcap/ . In this app someone went through the trouble of actually porting the kernel driver of RTL8187 chips to java… quite impressive. Unfortunately, this is the only chip that is currently supported. But in theory it should work as a RX device. Please keep us updated here about your developments! For a afternoon Projekt it’s pretty good 🙂 I don’t have a lot of experience in Android,too. 1) Unfortunately i had to do some small changes first to get it running on my device (Android 4.4 kitkat),so I can’t compare it directely. But what definitely decreased latency on my device was, that dequeueOutputBuffer now runs on a seperate thread,pulling the videoFrames as fast as possible out of the decoder .This gave me (tested) ~-40ms on my device, which brings up another point: The latency overall , and the improvements that can be made, seem to be very dependent on the gpu manufacturer. F.e: on my mali 450mp gpu a higher fps actually increases ! latency , which they actually mentioned somewhere in the moonlight code, or Intel devices need some fixups to enter low latency paths. In moonlight source Code they really have a list with the most common encoders,and which hacks they need, but i can’t test it on any other device than mine, so a lot of fixup have to be made for each device (and i don’t have the skills&time to do that ). I tested your app and I must say that I am quite impressed. I measured the latency to be somewhere around 130ms. My PC is still a dip better at 115ms but I think 130ms is a very good figure (Test device: Nexus 7 2013 running Android 6). Now we have a decent display device with low latency – quite a game changer. I tested the RTL8187 card with wifibroadcast (ALFA AWUS36H) but I could not get it to work. It kind of worked but it dropped too many packets. The video was there but it was unusable. So the approach of using the Android PCAP with this card is not an option 😦 So I guess I’ll stick with my custom kernel and chroot linux. I prefer this over the PI gateway since it reduces cabling. 1) about sps/pps data for : Because I couldn’t find clear information about h.264 Nalu header usw. (and the official documentation is really painfull to read) i analyzed the byte data coming from raspicam. I wrote some info about how to filter sps/pps data from the rpi stream into the source code to make the way free for eventual fixups. 2) I added a simple way to measure the latency from the hw decoder. When an input Buffer get’s filled, i put the current time in ms into it,and when i retreive an outputBuffer I can retreive this timestamp &compute the time the decoder needed. 3) ~53ms when using OpenGl for output. The weird thing is a) why does OpenGl need a shorter time for decoding,but a longer time to get displayed and b) WTF ! 55ms for decoding,but where comes the rest of overhead ? At the time I’m really confused,but there should be a lot of clearence left for improving latency. Second: what raspivid Parameters did you use on your nexus ? I really like the idea of plug&play wifi stick on android; eather way I always use some “ground station” . Your latency numbers are a bit contradictory. Strange… Did you take several measurements with the stopwatch? Assuming that L is the actual latency and T is the time between two frames, the stopwatch method can measure everything between L and L+T (L if you capture the image right after it has been displayed on the screen and L+T if you capture right before the screen is updated). That might explain some strange numbers but possibly not all. I used 6mbps, 48fsp, -g 48, everything else default values. – Size: Many phones have a motherboard that’s smaller than a Raspberry zero. My Galaxy Nexus would be such a candidate. If you strip it from everything and get it somehow to autostart then you would have a very tiny device. – Possibly latency: Much of the latency of the Raspberry system is created at the TX Raspberry (refer to https://befinitiv.wordpress.com/2015/09/10/latency-analysis-of-the-raspberry-camera/ ). Although it is not clear if Androids are better than a PI there is still a good chance to find at least /some/ phones that are better. After all, the MediaCodec backend differs a lot from vendor to vendor. I found a way how to reduce the overhead of ~30ms when using openGl instead of surface/texture View. The solution: calling glUpdatTexImage() and glFinish multiple times in onDrawFrame(). I assume that https://www.khronos.org/registry/gles/extensions/OES/OES_EGL_image_external.txt android buffers about one frame with this extension,even when using “singleBuffermode”. But i’m not sure if that is needed on all devices – i think it could add some overhead,too. That’s why i didn’t put it into the github apk at the Time. Just upgraded my phone to android 5.1 . First: now the approach higher fps- lower latency works on my device,too; at 49fps 720p I’m now have between 100-160ms , average 130ms latency,which is awesome ! I can’t say if my chip producer included some improvements on the gpu in this android release,too. But from now I will definitely stick to 5.1 ,especially as Android adds some features specific for MediaCodec,too (f.e asynchronous callbacks). I can’t say for sure,but (on my device) TextureView and OpenGl (which-i think,don’t know exactely,both use the external-texture-extension ) surprisingly perform better than SurfaceView. In fact,surfaceView shows artefacts on fps >30 and openGl doesn’t. I can’t wait to try it out in the field using my vr googles ! Since this conservation is getting bigger,are you active on any forum ? I use the same like mentioned by tomm,but it’s german. Yeah, i’m filming a blurry timer on my pc at 30fps,that’s not the best way,but i always compare sequences of ~10frames to get a latency number. However,android 5.1 seems to make this testing senseless,since it performs better & different. Android as rx: yes,that’s definitely worth some thinking. I would really like to have some better camera (the rpi cam isn’t bad,but) – it’s 2years old ! There don’t seem to be any other mini pc’s available on the market. (Imx freescale is the only dependant where it probably doesn’t need a team of hardware & software engineer to get a camera running) because they almost all use the same api’s ,but none manufacturer releases them for public/open source. But on any android device these api’s are included by the manufacturer in stagefright, and can be acessed indirect by MediaCodec. So,in cost of giving away some controll over the dataflow , i think android is a good way to go – especially,as MediaCodec is pretty easy to understand. Thanks a lot, both of you! I was having problem seeing the image in the field becouse of the low brightness of my notebook, but streaming to my cell will solve this. Do you have an idea of what can be causing that problem? Haven’t heard something for a long time here. But developing didn’t stop,and I added a lot of settings, to improve usability and compability on different devices (though,some chipsets, unfortunately,seem not to work). 2) the decoder actually (for me) takes less than 10ms, the rest of the lag is on the way the pixels have to go until they appear on the screen. as a conclusion, I would say – as long,as the decoder doesn’t buffer frames, the app has exactely 16ms more latency than the rpi, and – as a non-broadcom-engineerer – i can’t improve this further. But,and I am actually very proud of this, – http://fpv-community.de/showthread.php?64819-FPV-Wifi-Broadcasting-HD-Video-Thread-zum-Raspberry-HD-Videolink-fon-Befi/page193 there you can find a video – even nvidia Shield isn’t faster than my app ,and nVidia f.e has a much tighter controll over the hardware. (Honestly, 70ms lag for Gamestream is pretty ugly ). Great job! I follow the developments of your App closely and I am really impressed. I even bought a Cardboard because of it 🙂 Unfortunately, there are still some issues on my “Wiko Fever 4g” (seems to be dropping some of the data, the video is always corrupted). When I have the time I’ll dig a bit deeper into that and see if I can get it to work. If I have a fix, I’ll send you my changes. Hi Constantine. You are sow awesome! Your app is very great! Unfortunately I broke my Rpi camera lens, but for my pc works great! How’s the OSD going on the app Constantin? It seems like it’s all there, though just no way to get data to it? Another idea which would be great for it would be head-tracking output from the Android! You could get it to send the position data as values on the Mavlink! Would be quite awesome! I think you’ve done really great work constantin!! Anyone managed to build an Android image that one can use to just flash the device and use it ? Constantin – Thanks for the work on your app! I was just using basic Gstreamer stuff on android to get a sidebyside going. Taking it to openGL opens up a lot of options from an overlay perspective. I am using a RPi3 + Navio2 board with Ardupilot as my flight stack, so my flight controller and my video processor are the same hardware. Alfas for RX and TX and Nexus 6P with the daydream headset as my hardware on the ground. I think if I get things right I should be able to add controls and a data link through the serial 3DR radio and something like MAVProxy. Befinitiv – are you still actively working on this project? Thanks to everyone, this blog has been enormously helpful. Dear befinitiv, please recheck the “Trackback & Pingback” block for improper links. Or Hacker Planet site was hacked by bad boys – that is why I could not see the original content of it.